What is Type Safety ? 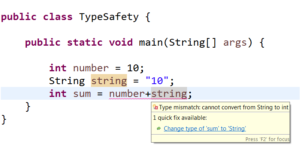 Type safety is prevention of typed errors in a programming language. A type error occurs when someone attempts to perform an operation on a value that doesn’t support that operation. In simple words, type safety makes sure that an operation o which is meant to be performed on a data type x cannot be performed on data type y which does not support operation o. That is, the language will not allow you to to execute o(y). The output is the concatenation of number and string. As java is type safe, you cannot perform an arithmetic operation between an int and string. Type-safe code won’t allow any invalid operation on an object and the operation’s validity depends on the type of the object.